Laser researchers in Munich are challenging a basic assumption of engineering: "You can't have it all." They have shown that for certain kinds of laser applications in biomedical imaging, material processing, and communications, a new approach could deliver the desired capabilities with no problematic tradeoffs: in compact, inexpensive, efficient and long-lived devices that produce ultrashort, high-energy light pulses. This research is a close collaboration between members of the Electrical Engineering and Information Technology Department at the Technische Universitaet Muenchen (TUM) and the Physics Department of LMU Munich. Their latest paper, published in Nature Communications, describes experiments showing that cheap, robust semiconductor lasers can produce high-energy light pulses as short as 60 picoseconds (trillionths of a second) without the drawbacks of previous approaches in terms of power consumption and device size. At the same time it presents theoretical results predicting that this technique will break the next barrier for such lasers: subpicosecond pulses. "Our models and simulations actually let us identify changes in the experimental setup that could yield a further thousand-fold improvement in performance," says Dr. Christian Jirauschek of TUM, "potentially producing pulses shorter than 30 femtoseconds." The Munich researchers' approach employs a relatively new kind of laser in a novel configuration. Dr. Robert Huber, leader of the LMU group, is co-inventor of this device, the Fourier domain mode-locked (FDML) laser. Rather than emitting light centered on one highly specific "color," the FDML laser rapidly and repeatedly sweeps through a range of wavelengths. The idea behind the experiment now is to reshape the continuous wave output from the FDML laser to short intense pulses. 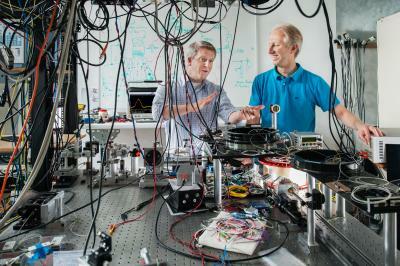 "The advantage of this experimental configuration," Huber explains, "comes from storing the entire energy of each FDML laser sweep directly as a light field -- spread out like colors of an infrared rainbow -- in a kilometer-long optical fiber inside the laser resonator." This is more efficient than storing the energy in the semiconductor structure of the laser source. The different wavelength components travel at different speeds and enter a second optical fiber, outside the laser, at different times. This second fiber is laid out so that the different speeds exactly compensate for the different entry times: All colors exit the second fiber at the same time, forming a short laser pulse. This is the key to preserving high output energy even while shortening the pulse time -- without increasing power consumption or requiring the use of a larger device. This research was supported by the Emmy Noether program of the German Research Foundation (DFG) -- HU 1006/2-1, JI 115/1-1; by the DFG project JI 115/2-1; and by the European Union through FUN OCT (FP7 HEALTH, contract number 201880) and FDML-Raman (ERC contract 259158).